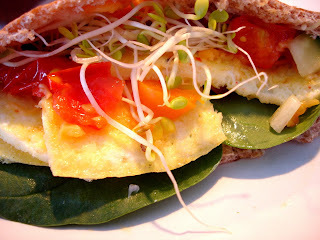 Mary Ellen's Cooking Creations: Quick, Easy, and Healthy Breakfast...or Lunch! I had some extra time this morning so I made myself a really yummy and healthy breakfast. I was planning on making 2 quick eggs but then I saw the leftover veggies from last night in my fridge and I remembered that I had a whole wheat pita to use up in the next day or two, so I started throwing all of the ingredients together. This breakfast was so delicious and healthy and should hold me over for a while! Chopped cooked veggies - I heated up and used tomatoes, zucchini, orange pepper, and red onion. I also added raw spinach and sprouts. Spray nonstick pan with fat-free cooking spray and heat over medium heat. Beat egg, adding spices as you beat. Add to pan and leave it alone over medium-low heat. Flip the egg once the under-side is cooked. Top with the cheddar cheese and cook for 30 more seconds (I like fluffy eggs but cooking the egg this way makes a nice, flat egg perfect for putting into the pita). Spread the Laughing Cow cheese on the inside of each pita pocket. Stuff with the egg and veggies. I think this took me 7 minutes total to cook. What a great way to use up some leftover veggies! looks so good! i'll have to try this for breakfast one morning soon! I just stumbled upon your blog and am loving it! This picture caught my attention immediately - it looks so refreshing and delicious. 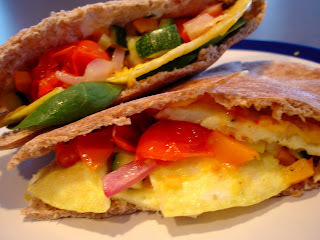 I have pitas in the fridge just waiting to be used for a breakfast like this!